Tonnes of ice are captured collapsing off the face of the Margerie Glacier in Alaska’s Glacier Bay National Park (photo: Quentin Long). 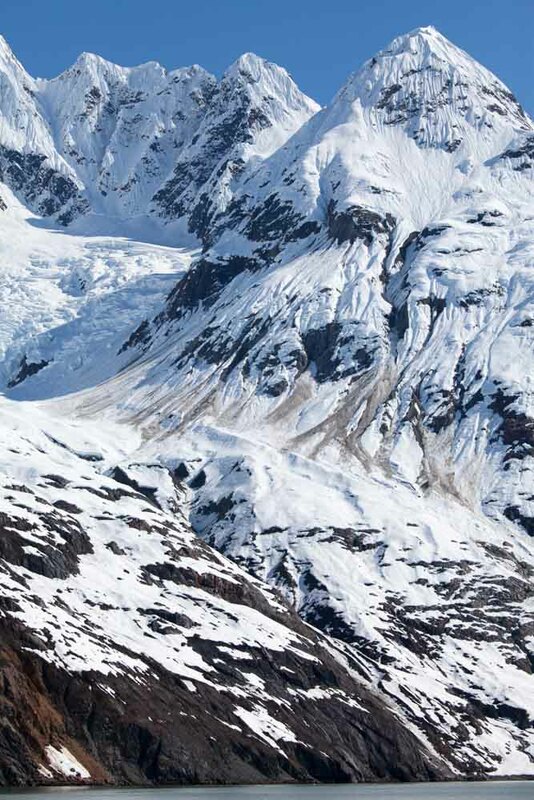 The jagged peaks of Jaw Point overlooks Glacier Bay (photo: Quentin Long). The Sea Bird in Lowe Inlet. British Columbia (photo: Quentin Long). 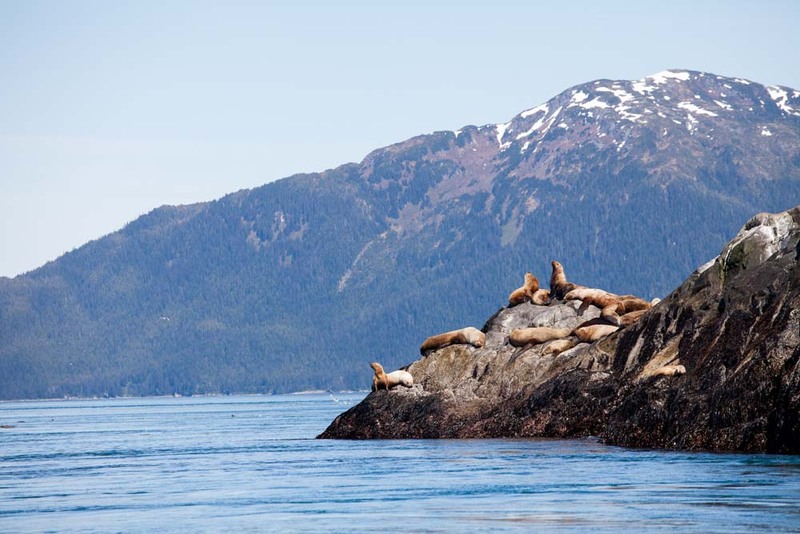 Steller sea lions guard the entrance to Glacier Bay National Park in Alaska (photo: Quentin Long). 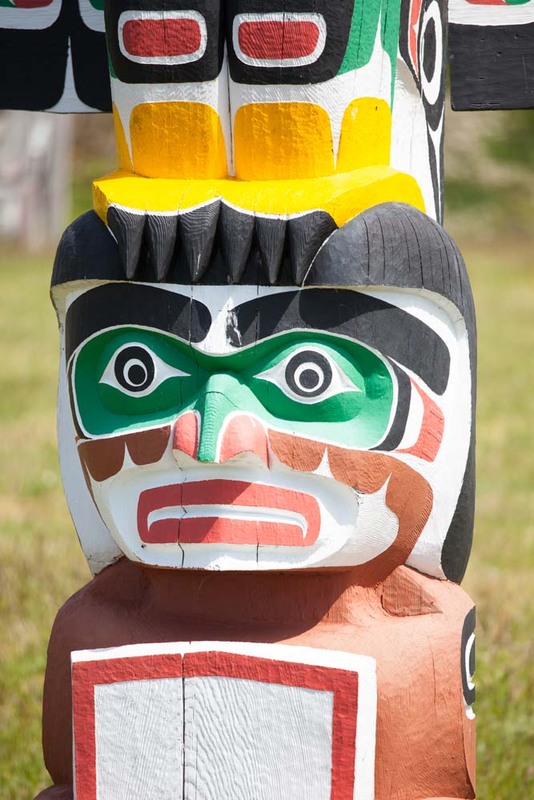 A totem at a burial ground in Alert Bay, Canada (photo: Quentin Long). Leaving Margerie and Grand Pacific glaciers behind (photo: Quentin Long). 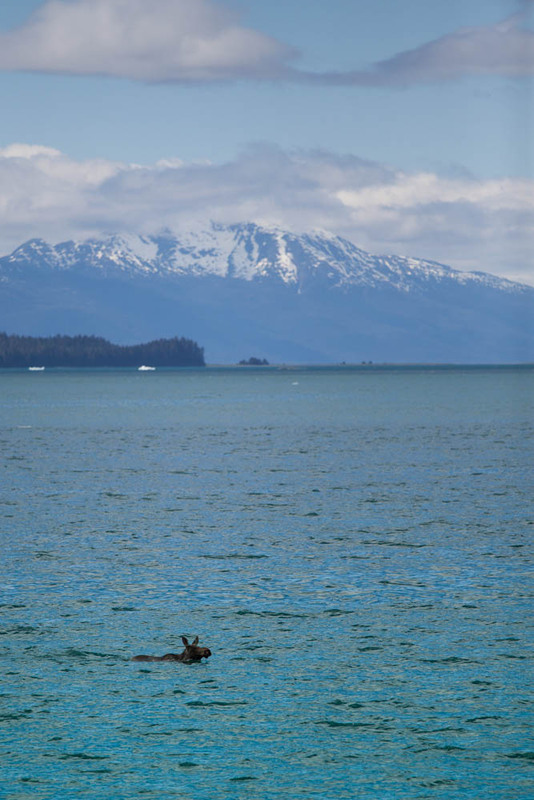 An interesting sight during a cruise to Alaska's Misty Fiords National Monument; a moose swimming across the channel (photo: Quentin Long). 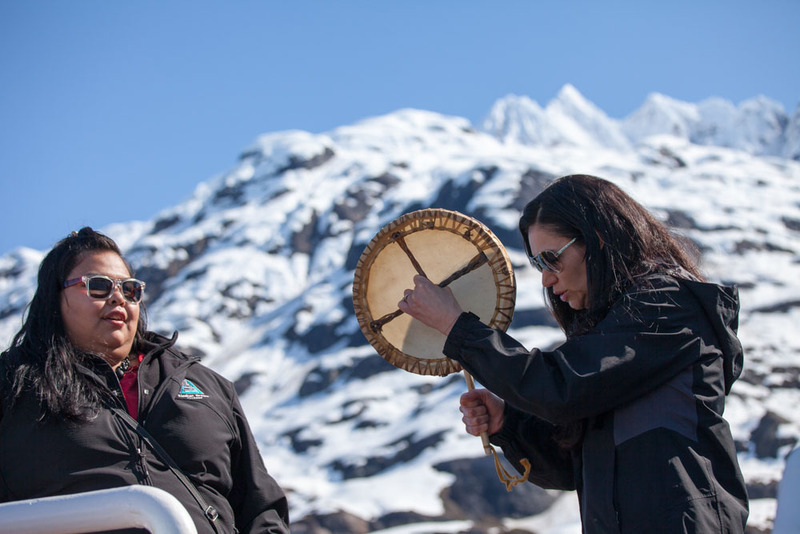 Members of the Tlingit tribe perform a traditional song (photo: Quentin Long). 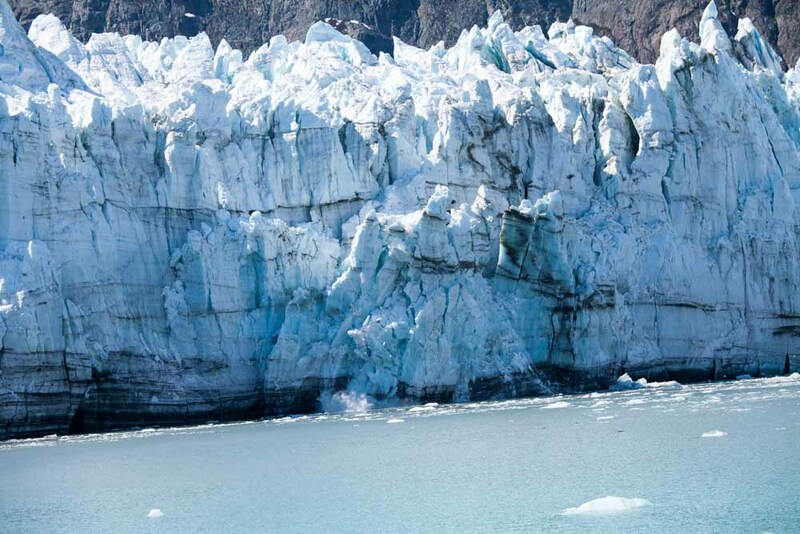 The mighty power of the Dawes Glacier has left its mark in the cliff faces of Endicott Arm. (photo: Quentin Long). 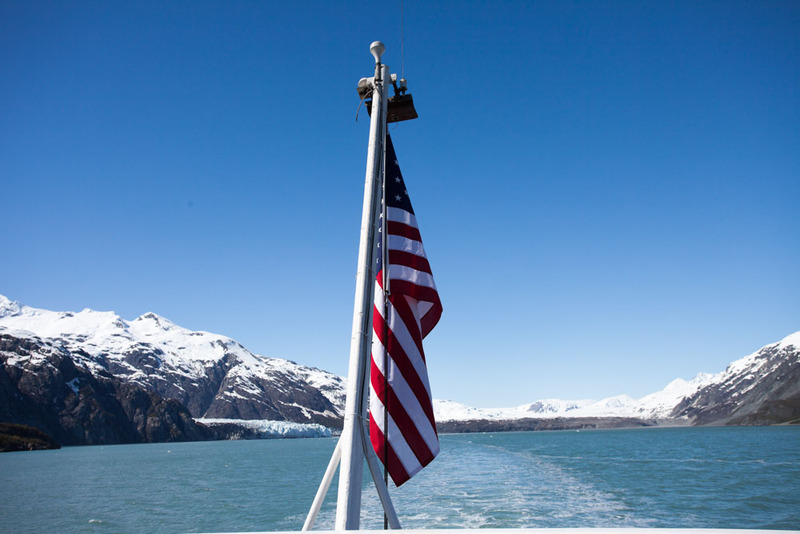 The Sea Bird staff are on hand to help with capturing photos of beautiful Alaska (photo: Quentin Long). 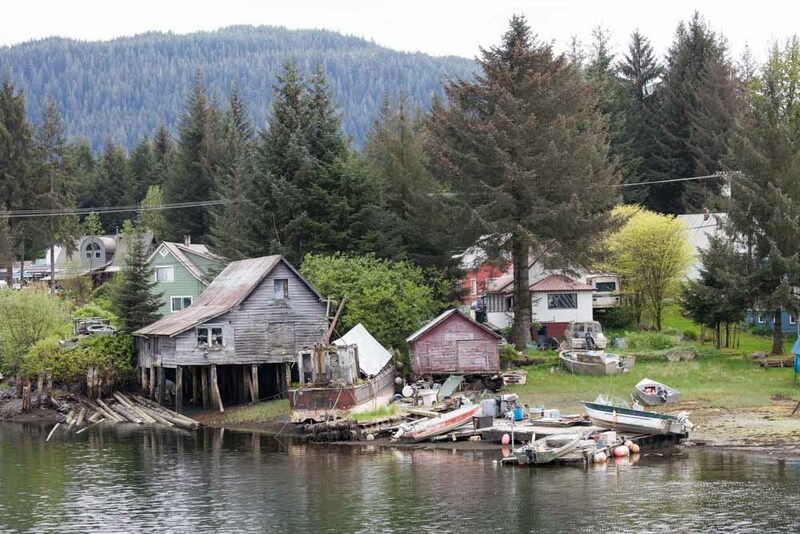 Old houses on the outskirts of the city of Petersburg, Alaska (photo: Quentin Long). 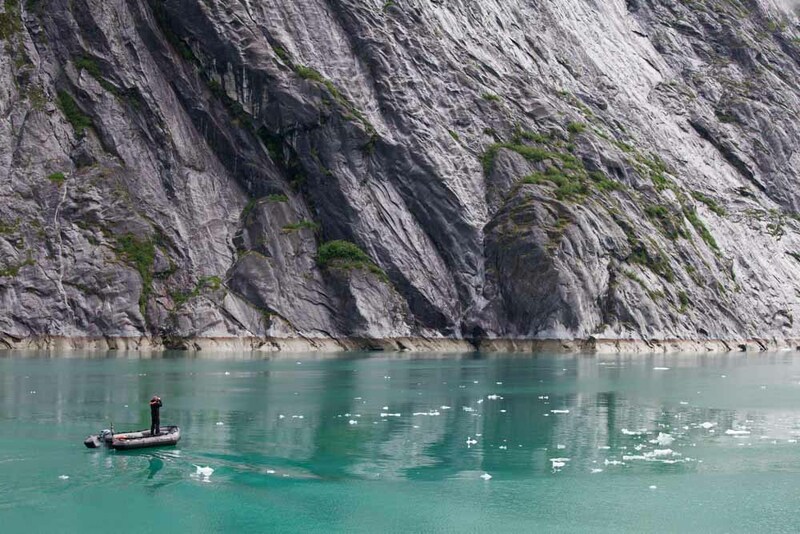 A DIB (inflatable boat) is lowered into the calm waters for a closer look at the Dawes Glacier in Endicott Arm (photo: Quentin Long). 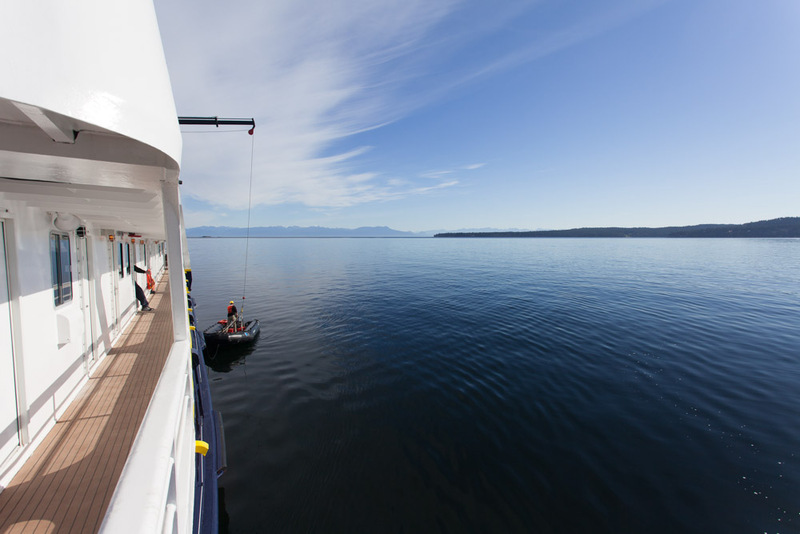 Take an expedition cruise to remote Inside Passage, Alaska, with us, a remote corner of the world where nature rules supreme among people steeped in tradition. Words & photography Quentin Long. Seagulls squawk angrily as they greedily scoop bits of fish off the water’s surface. Bald eagles with talons thrust forward bully their way through the seagulls to get their feed as well. In the centre of all this activity are the Steller sea lions. About 30 to 40 of them are in a feeding frenzy. Surfacing with fish in their razor sharp teeth, they thrash their piscine catch to pieces. These two-metre-long balls of muscle are nature at its most furiously wild. I’m watching the action just 10 metres from the action in an inflatable called a DIB off the Inian Islands, Alaska. Several of the sea lions become curious once they’ve had their fill. Effortlessly they glide through the water and turn on their sides as they approach to eyeball the nine passengers, revealing their lethal smiles. I feel like I’m part of the crew on a BBC nature documentary. It all began rather sedately. After departing Seattle late in the afternoon and clearing Canadian customs the following morning, the National Geographic Sea Bird travels the Georgia Strait between the Canadian mainland and Vancouver Island without pause. We keep busy with lectures on how to enter and exit a DIB, and introducing the bird life of Alaska, before a workshop led by the two onboard National Geographic photographers, Jeff Mauritzen and Steve Morello, who will be our personal photographic coaches for the duration of the journey. 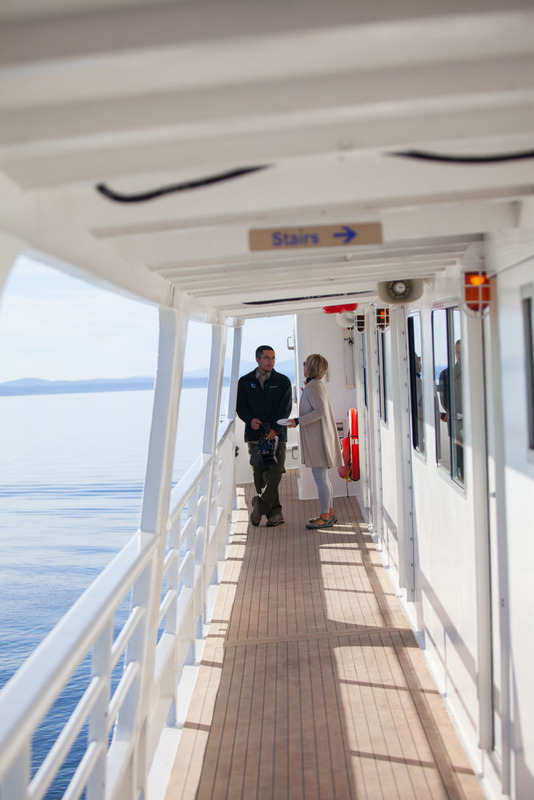 Then just before dinner, with drink in hand, expedition leader John Mitchell calls all guests on deck to watch a pod of feeding killer whales. This is the only sighting of orcas we have for the voyage. The next day we seek them out in the appropriately named Blackfish Bay without success, but we are happy to make do with a pod of white-sided dolphins feeding around the boat. At the entrance of Blackfish Sound is Village Island, an historic site for all the wrong reasons. In 1921 the Kwakwaka’wakw (pronounced quack-whack-ee-yack) people were conducting a potlatch – a traditional gift-giving ceremony outlawed by the Canadian Government at the time – that was raided and the ceremonial materials and masks confiscated. These cultural artefacts have now been returned to their rightful owners and are on display at the U’mista Cultural Centre in Alert Bay on Vancouver Island. The centre is a three-roomed exhibition space, the main collection displayed in a traditional Big House crafted from the beautiful timbers native to the North West. Our guide Lilian is a diminutive women who speaks in a clipped, sweet voice that belies the significance and insight of her words and the culture she represents. The universal relevance of this wisdom is not lost on me. It looks like a torpedo. Something is moving very fast just below the surface of the water zeroing in on the ship. Jeff Mauritzen knows exactly what it is; mid-sentence he leaps to his feet, grabs his cameras and hares off to the bow. Three Dall’s porpoises, similar in colouring to a killer whale, are playing off the bow of the boat. Minutes later they are gone; the ship was not fast enough to entertain these mammalian missiles so they quickly move on. Jeff is ecstatic and then pauses to tell me exactly why none of my shots have worked. He and Steve are enthusiastic teachers, generous with their knowledge and genuinely keen to see everyone “make great images”. Leaving Vancouver Island behind, the Sea Bird navigates the fittingly labelled ‘narrows’ and ‘channels’ of the northern reaches of British Columbia. The gently rounded hills are replaced by steep walls of trees as the infamous grey clouds of the North West Pacific coast close in, bringing the equally famous rain with them. Inaccessible for larger ships, it is a privilege to be able to visit these rarely seen landscapes. But it is the fauna that turns out to be even rarer. As the Sea Bird glides silently into a smaller channel, no wider than 40 metres, towards an abandoned salmon cannery at Butedale, one of the most unique animals in the world wanders out of the trees. A spirit bear. A black bear that, thanks to a recessive gene getting to express itself, is in fact white (and a little orange). There are only around 400 in the world and they only inhabit a very small patch of BC, four islands of temperate rainforest. People spend their entire lives seeking them out and never see one. We cross from BC to Alaska’s Misty Fiords National Monument overnight. Opening my cabin door the landscape has changed yet again. Alaska is energetic compared to British Columbia, more severe and hard. The wilderness is no longer mildly rugged but massive, awe-inspiring and foreboding. The channel sides are battered walls of granite, where water gushes and pounds boulders, scarring the cliff faces with waterfalls. The clouds have gone and the brilliant sunshine is interrupted only occasionally by dense mists. The most unusual series of events of the entire trip happen here. The ship slows to a crawl signifying that someone has spotted something. “We seem to have a moose swimming across the channel,” says expedition leader John Mitchell. I rush to the foredeck and there, indeed, is a moose swimming the channel. For the next half an hour we watch as it completes the three-kilometre crossing. Elise, one of the naturalists, points to a far shore. A female brown bear is sitting in the long green grass with another two bears further off. As the bears mosey along the green apron of the shore, Steve points to a pod of humpback whales. In the space of 90 minutes, I’ve seen a swimming moose, a trio of brown bears, and a family of humpbacks. And two days later I come face to face with my first glacier when the Sea Bird drops anchor several kilometres from the face of Dawes Glacier in Endicott Arm. The DIBs are offloaded to take us to within about 500 metres of the face of the glacier. As we zip through the ice, pregnant harbour seals lie like slugs on the larger floes. It’s the safest place for them to give birth as bears patrol the shoreline. Nature proves to be an incredible sculptor as hunks of ice are shaped into all manner of motifs; I see swans, Pegasus and several rabbits. All of this is accompanied by a surprising soundtrack. The frozen water is constantly popping and cracking; it’s like being in a massive bowl of Rice Bubbles. Then the snap, crackle and pop turns to booming, cracking and thundering as an 80-tonne chunk of ice collapses. The ‘calving’ event causes a feeding frenzy for sea birds as stunned fish surface and become easy pickings. Doug, the naturalist on our DIB, points out the Arctic terns buzzing around. The glaciers here are significant, an open-air laboratory revealing in vivid clarity how landscapes are shaped. The park itself is divided into two major arms or inlets and we explore much of it. Passing the amusingly named Gloomy Knob en route to the two most famous glaciers, Margerie and the Grand Pacific, mountain sheep graze along vertiginous cliffs. We see a brown bear desperately trying to navigate its way down the 400-metre peak for a spot of lunch, but the sheep are unperturbed, knowing there is no way it can traverse the cliff. For visitors, the Grand Pacific is rather underwhelming, a brown rocky mess. Its bad looks are amplified because it shares a bay with the supermodel of glaciers, Margerie. The two almost touch. But the Grand Pacific is important because it once covered the entire bay and its rapid retreat is alarming. 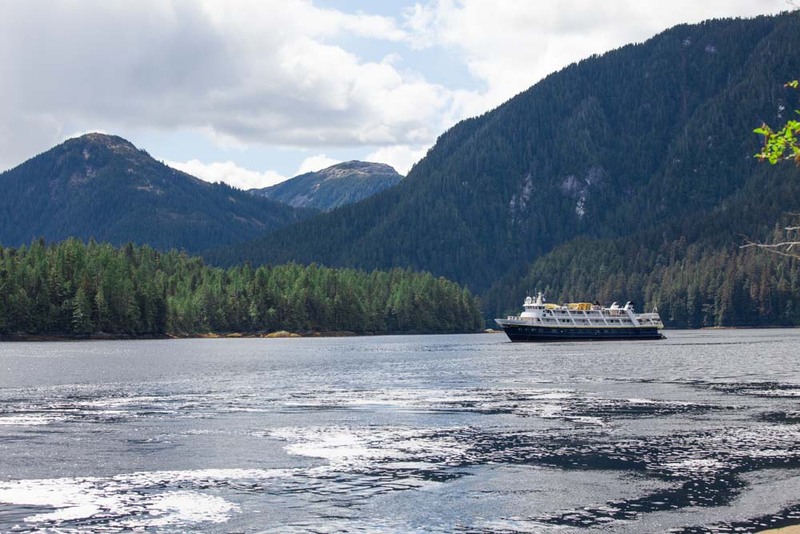 From when records were first taken in 1794 by Captain George Vancouver’s team, until naturalist John Muir’s first journey in 1879, the glacier had retreated 77 kilometres to reveal the bay we are cruising through today. By 1916, the retreat had accelerated and was a further 30 kilometres up the bay area. For an hour, the Sea Bird idles about 400 metres from Margerie’s face and we watch as several thousand tonnes of ice sheer off. Making our way back up the bay we venture into another inlet to find one of the few healthy glaciers: Johns Hopkins. The jagged peaks are beautiful and the sun is brilliant without a cloud in the sky. The journey has been full of life-affirming beauty. But here, in the furthest reaches of the Inside Passage, it becomes overwhelming; a visceral, searing beauty that humbles one to realise that we are merely another species momentarily caught in its dramatic vortex.